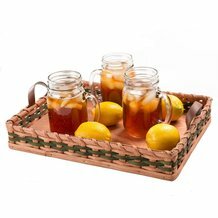 Locally made by Amish artisans, handcrafted serving tray adds that rustic charm to your picnics, parties and family dinners. 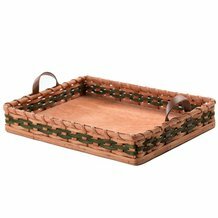 Features handwoven sides (like a basket) with a flat wooden bottom, so you can conveniently carry food, silverware, condiments and more. When not using, display in your home for a beautiful decoration. Note: Due to the unique nature of this item, the lacing color (stripes) can vary than what is pictured. This was a great find. The workmanship is of top quality. Hats off to the gentleman who crafted this item.